Athens City School System, we hope you had a great Spring Break! 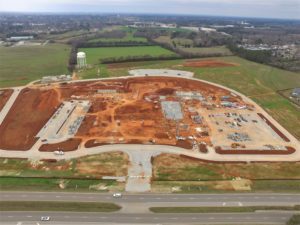 Now that you are back, it’s the perfect time for a progress update on the new Athens High School. Safety is the top priority of Athens City Schools and Martin & Cobey. We live in an area prone to tornados, so it is important that the new Athens High School is a safe place during severe weather watches and warnings. 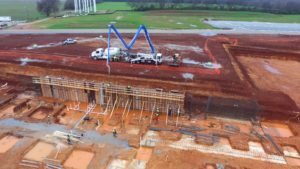 Athens High School’s storm shelter, which will be able to withstand 200 mph lateral wind, will be large enough to house the every student, teacher and staff member with a 1,916 person capacity. The first segment of the storm shelter wall has now been poured. 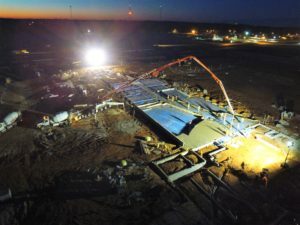 The Athens High School project is currently staffed with 100 workers, who work each day, and sometimes nights, to install the foundation for the roughly 265 thousand square foot educational facility. The Golden Eagle Marching Band will not be disappointed by its new 4,338 foot band area, which includes a practice room, uniform storage, large instrument storage and an office for the director. Above grade masonry, or walls, for the future band area are going up currently. Permanent roads and parking lot installation is underway. 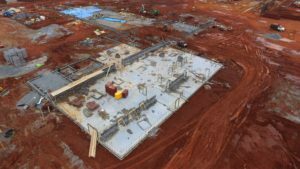 The new high school will have 5 parking lots with approximately 612 total parking spots. Martin & Cobey is excited to be working on this project and to update you with our progress! Check back for more updates soon.